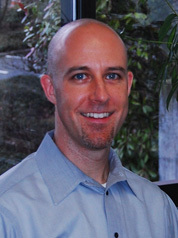 Dr. Aaron Ilk was born and raised in the Pacific Northwest. He graduated from Peninsula College before relocating to Portland to complete his undergraduate work. He received his Doctorate of Chiropractic from Western States Chiropractic College in 1998 at the age of 24. Since then, Dr. Ilk has operated a busy, patient-centered practice in Bellevue, WA. As an evidence-based Chiropractor, he integrates his alternative, holistic approach with other providers, such as orthopedists, physiatrists, and primary care physicians. His specialty areas include back pain, neck pain and headaches, and spine trauma including whiplash. His youngest patient was his daughter at 3 weeks old, with his oldest patient being over 100. Dr. Ilk was selected as a co-editor of a musculoskeletal dictionary and is a regular lecturer and consultant in his community. He presents on such topics as ‘Evidence Based Chiropractic’, ‘How to choose a good Chiropractor’, and ‘Posture and Ergonomics in the Workplace’. His practice philosophy is simple: Problem. Solution. Prevention. In addition to being an accomplished cellist (performing at Carnegie Hall in 1988), Dr. Ilk was both a professional mountain bike racer and mechanic. These days he is an avid runner, skier, and golfer. He shares these passions with his wife and two kids.